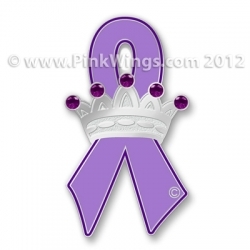 This beautiful Crown Purple Ribbon Pin is 1 1/4" tall with 5 small stones on the crown. Purple stands for Relay for Life, All Cancer Awareness, and Pancreactic Cancer Awareness. Order your pin today!